Mystery to the location of the Bulls Head Hotel Stoney Middleton solved thanks to old post card. The existence of the former Bulls Head is a documented fact (details at Wishful Thinking) , however, its location was until now unknown (at least to SMHCCG). 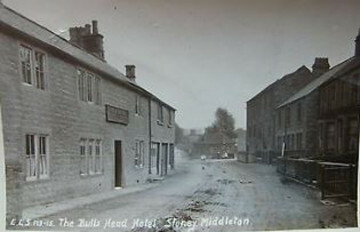 The postcard was found online on the Word Point website by an eagle eyed member of SMHCCG and is listed as having been sold on EBAY. We shall try and track one down as the quality of this one is not good. However, it clearly shows its location a few hundred yards west of the Toll House (chip shop) heading out of the village towards Tideswell. The building is no longer and is now a small area where locals park their cars. Looking towards the Toll House on the right hand side is another building which has since disappeared. It stood between the old Royal Oak pub and the Cottages and was believed to be a boot factory.